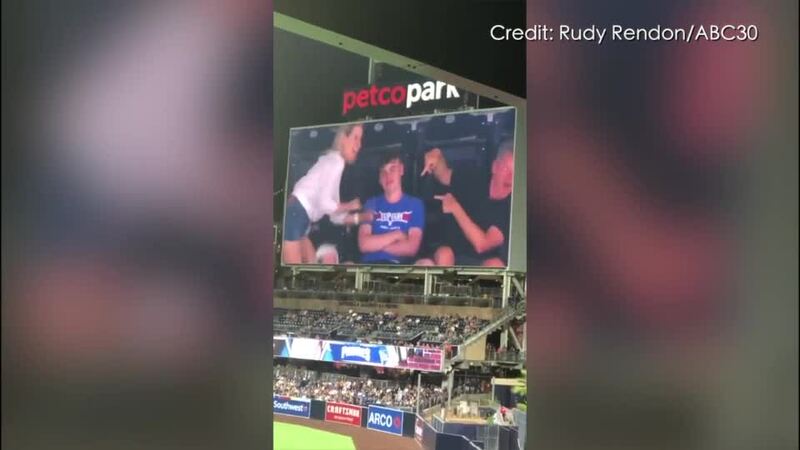 Two adults, and one red-faced teen, are the latest fans to go viral at a San Diego Padres game this season. SAN DIEGO (KGTV) — This Padres season continues to produce memorable moments in the stands of Petco Park. First, it was Gabby DiMarco, who chugged her beer to a roaring crowd immediately after catching a foul ball in the very same cup. One fan brought a monstrously large glove to the park and caught a ball. 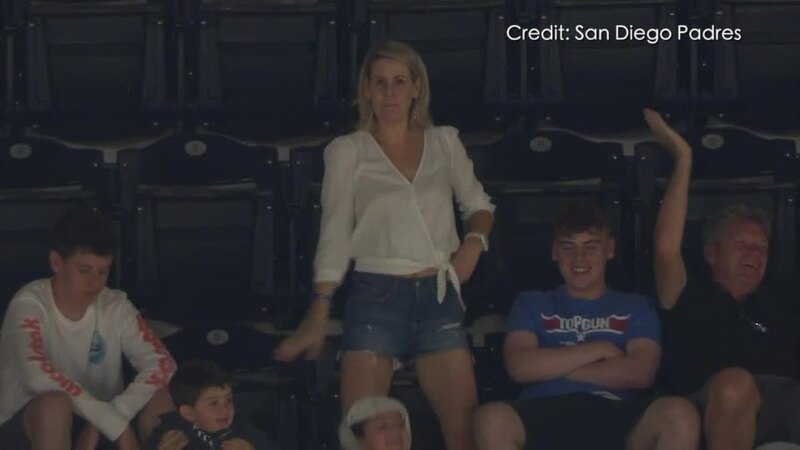 Another fan experienced an emotional roller coaster after losing a foul ball , only to be rewarded with one from the opposing team's broadcast crew. Now, we have the dancing adults and red-faced teen. As the San Diego Padres faced off with the San Francisco Giants on Monday night, the park's big screen caught two fans getting down to Flo Rida's "Low." Between them, a horrified teenager. Rudy Rendon, from Fresno ABC-affiliate ABC30, captured the moment, showing a woman dancing while a man bounces to the beat in his seat — the teen seated between the two. Both take turns pointing at the boy as the camera zooms into his face, which by this time has turned as red as the stitching on a baseball. Twitter soon ran with the footage, one user writing , "this mom embarrassing her son is the mom all moms should aspire to be." While it's not clear whether the duo is the boy's mom and dad, they sure embarrassed him as only parents could. Hats off to you, dancing adults. Thank you for making a bleak game enjoyable (the Pads lost 5-3). And to the teen, cheer up. You're famous!